We can only hope that John Singer Sargent didn’t actually get this close to this bunch of mean, muddy gators. This watercolor is really convincing. Honestly, I had to do a double take when I first saw it. But I guess that’s what happens when you get to see what one of the greatest artists of his time painted on his own time. The beautiful play of light and shadow is straight out of a Monet painting. Sargent developed the Impressionists’ love of light so well that Monet actually allowed Sargent to visit him in France. At the time of his first visit in 1885, Sargent was the only American known to hang with the Impressionist master. Sargent was mainly famous for his stunning portraits of Gilded Age society families. Although Americans loved to sit for Sargent portraits, the English didn’t come around until the 1890s. But once they recognized how good he was, they snatched up portraits by the dozens. Even contemporary artists like Kehinde Wiley still recognize the power behind Sargent’s captivating portraits. Maybe he would have been more satisfied with seeing this careful and almost loving image of some pretty scary gators. Despite the fame he received for his oils, Sargent also dabbled in watercolor. In fact, he usually painted these to help him get through the pains of the numerous portrait and mural commissions that dominated his career. This is especially true of Muddy Alligators. Sargent came to hate portraits so much that he almost entirely stopped painting them after 1910. He was at a point in his career where he no longer had to pick up every commission that he received. But when John D. Rockefeller requested that Sargent paint his portrait, Sargent couldn’t refuse. The portrait has become so well-known that many copies now exist, including one in the National Portrait Gallery. Sargent traveled south to visit Rockefeller at his home in Ormond Beach, Florida, in 1917. Although Sargent’s talent made him the obvious choice for the commission, a portrait of one of the most wealthy and powerful businessmen in the world is a tall order. 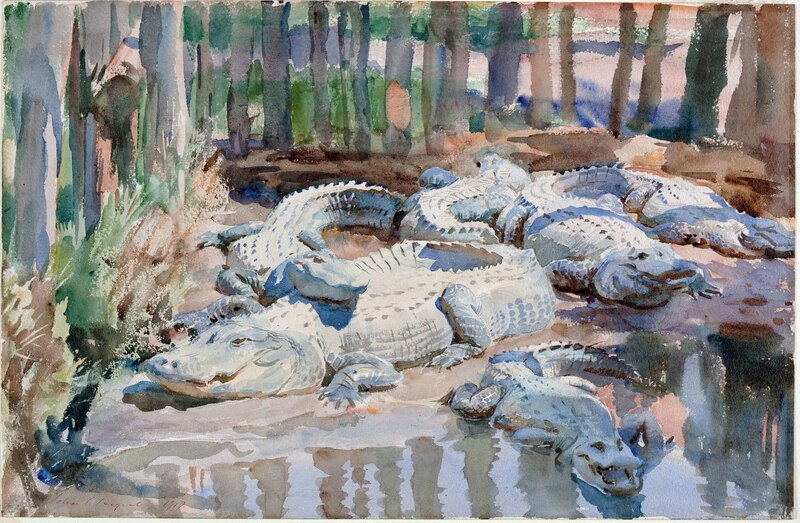 Sargent turned to his watercolor practice to destress and record the fascinating Florida landscape, full of exotic palmetto plants and hissing gators. Sargent took care to capture the compelling scenes he witnessed. Remember, this was before Florida became the haven for weirdos, with shocking events that dominate Internet headlines, that we know and love today. He studied the alligators intensely and used some pretty inventive techniques, including scratching into the paper to show the details of the alligators’ scales and teeth. Sadly, there are no records of Sargent wrestling any gators. Hedrich, Stephanie L., and H. Barbara Weinberg. American Drawings and Watercolors in The Metropolitan Museum of Art: John Singer Sargent. New York: The Metropolitan Museum of Art, 2000. Smithsonian National Portrait Gallery. “John D. Rockefeller, Sr.” National Portrait Gallery Collection. https://npg.si.edu/object/npg_NPG.67.17. Accessed January 27, 2019. The Metropolitan Museum of Art. “Kehinde Wiley on John Singer Sargent.” In The Artist Project. 2015–2016. http://artistproject.metmuseum.org/1/kehinde-wiley/. Accessed January 27, 2019. Weinberg, H. Barbara. “Americans in Paris, 1860–1900.” In The Heilbrunn Timeline of Art History. The American Wing. The Metropolitan Museum of Art. October 2006. https://www.metmuseum.org/toah/hd/ampa/hd_ampa.htm. Accessed January 27, 2019. Weinberg, H. Barbara. “John Singer Sargent (1856–1925).” In The Heilbrunn Timeline of Art History. The American Wing. The Metropolitan Museum of Art. October 2004. https://www.metmuseum.org/toah/hd/sarg/hd_sarg.htm. Accessed January 27, 2019. Worcester Art Museum. “John Singer Sargent: Muddy Alligators.” Collection. https://www.worcesterart.org/collection/American/1917.86.html. Accessed January 27, 2019.